Enjoy the beauty of Oahu's gorgeous North Shore and the world famous Hanauma Bay State Park on this full day tour from Waikiki. 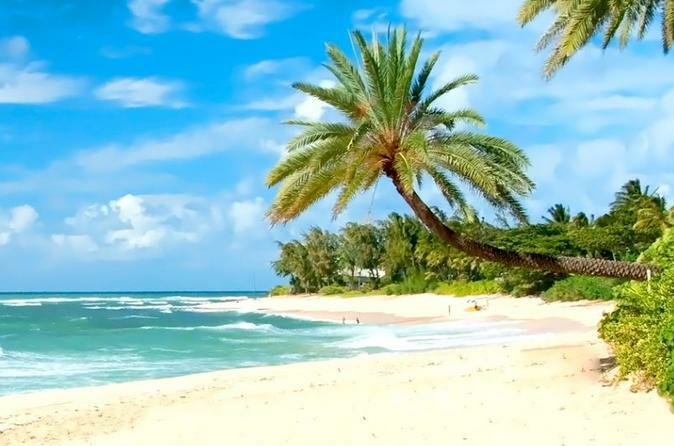 Visit the Banzai Pipeline Beach, Waimea Bay, Turtle Town, and Dole Plantation on a comfortable mini-bus or van. Stop to Paddle Board or Kayak on the beautiful Anahulu River before ending the afternoon snorkeling at Hanauma Bay State Park, one of Hawaii's premier reef's for viewing tropical fish and Green Sea Turtles. Lunch at Tsue Farms and Paddle Boarding or Kayaking are included with upgrade to Premium package. Hawaii's north shore has long been considered a mecca for surfing aficionados and big wave chasers. The Banzai Pipeline Beach, home to the The Billabong Pipe Masters and the third stage of the Vans Triple Crown of Surfing, annually host a collection of the world's best surfers. Along with big waves and rolling surf, the North Shore is also home to paddle boarding, wild life viewing and small family-owned Shrimp Trucks. Your tour starts with an 8am pick-up from your Waikiki hotel and a short drive up the middle of island to the famed Pipeline beach where the world champion in surfing is crowned every year. Your guided, fully narrated tour is led by a friendly local whose rich knowledge of the history and culture of the area will teach you everything you ever wanted to know about Hawaii's most populated island. From there, you will hit the main sites at the North Shore such as Waimea Bay, Banzai Pipeline, Dole Plantation Plantation and Turtle town. After a stop for lunch at your guide's favorite Shrimp Truck, you will have time to Kayak or Paddle Board before heading to Hanauma Bay State Park for an afternoon of snorkeling and swimming. Hanauma Bay State Park is regularly voted one of the top locations on the island of Oahu, so look for turtles as you swim over the reef among schools of brightly colored fish and coral. As the tour winds to a close, pack up your belongings and head back to the Limo for a short 30 min drive back to Waikiki and your hotel. By approximately 5pm, you should be back and ready for dinner.